All of our machines take cash in $1’s, $5’s, $10’s and $20’s, except for our West Vending machines which only take quarters and tokens. All of our machines take quarters, but no other change such as dimes, nickels or pennies. All of our machines take our tokens. Our drive thru and hand bays accepts all major credit cards. What is our Express Key? Own the KEY to the nicest carwash in town! This fantastic KEY is much like a gift card and may be used at anytime, multiple times up to the preloaded value. You may use the convenient ExpressKEY at the hand bays, vacuums, large vending machine, and our highly popular automatic carwashes. Simply insert the ExpressKEY into an ExpressKEY key reader and you have access to all the fantastic equipment; at automatics follow prompted instructions and at all other machines time starts immediately. Don’t throw it away because another awesome feature with the ExpressKEY is its capability to have money re-added, making it reusable. 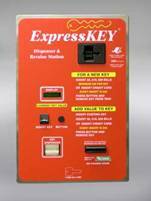 To purchase or re-credit your ExpressKEY visit the ExpressKEY dispenser at the North side of California Carwash, there at the ExpressKEY dispenser you may purchase or add value to your ExpressKEY with the options of cash and/or credit. Is reuseable, where money can be added as needed, with a maximum holding of $50. Press the silver button and your ExpressKEY will be dispensed in the tray. Remove your ExpressKEY from the tray and proceed to use throughout California Carwash. *Any amount can be added up to $50.00. Insert your ExpressKEY into the black, square key reader. If there is a remaining balance on your key, it will be displayed in the digital message display. (This is also a great way to simply check the balance on your existing ExpressKEY). When adding money to an ExpressKEY, you can use cash or credit. Press the silver button and your money will be added to your ExpressKEY. Remove your ExpressKEY from the key reader and proceed to use throughout California Carwash. Express Key is perfect for your key ring! Express Key can make a perfect gift! Itemized monthly invoice by key with the usage broken down of time, date and service used. Sign up for a corporate account and upon approval you will receive the requested amount of credit Express Keys for you, your employees or vehicles. At the end of each month you will receive an itemized invoice by key with the usage broken down of time, date and service used. Please contact us if you are interested in a Corporate Account for you and your business!